The aerospace sector has always been at the forefront of technological change, and now it is spearheading a change that worries many: a shift towards automated manufacturing. But will this, as many fear, signal a reduction in jobs, or is it an opportunity to redefine manufacturing skills for the new century? 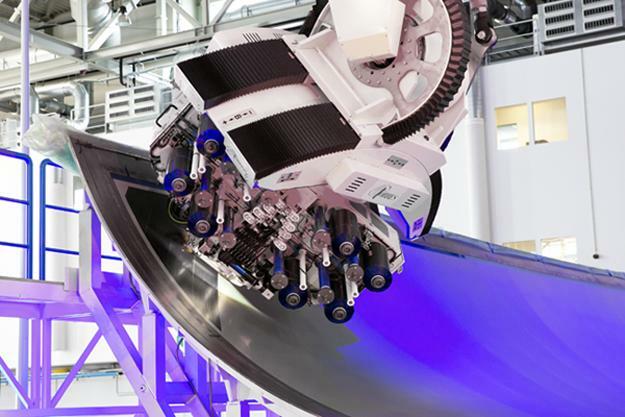 At Airbus’s site in Hamburg, one of the most striking manifestations of automated manufacturing is hard at work. With its latest aircraft range, the A350, having a much larger proportion of composites in its structure than older aircraft, new manufacturing technologies are a crucial part of the Airbus strategy. 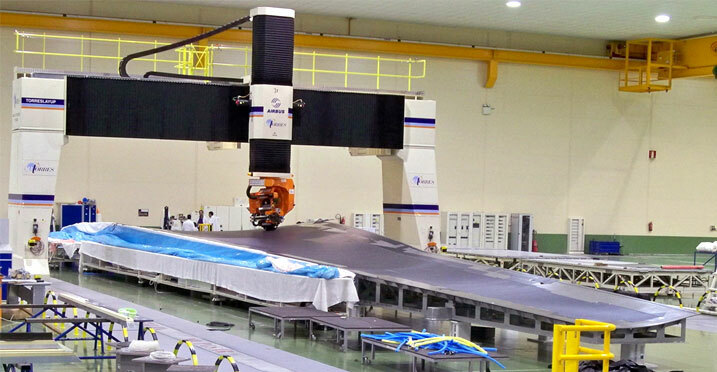 The aircraft wings, for example, are wholly composite, and the company has switched from manual to fully automated production for the wing components. 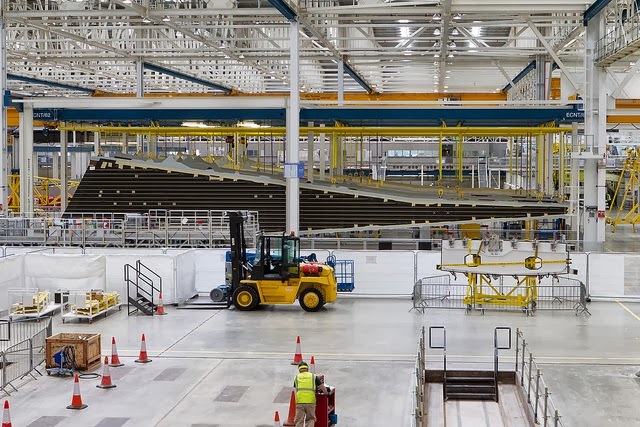 Whereas at the outset of A350 production, the wing covers – the skin that sits on top of the wings’ inner structure – was laid up by hand, the company has recently started using automated fibre placement to build the wing covers. It’s a striking sight. Like most large composite parts, the wing cover is made up of a series of layers of tapes; carbon fibres arranged side by side and impregnated with resin, with each strip about 5cm wide. These are unrolled from large spools into what is referred to as the tool – essentially a negative impression in metal of the final piece. The strips are laid side by side from the roots of the wing to the tip until the tool is completely covered, then the next layer goes from the leading to trailing edge of the wing, and then a layer at 45° to both. The machine that does this dangles from a moving gantry that sits above the tool. 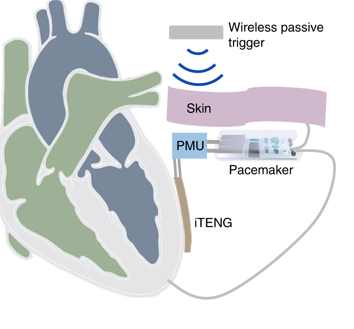 Tracking backwards and forwards and side to side, over the 32m length and 6m width of the tool, the device resembles a moving sewing machine. Its sides are studded with spindles that hold the reels of composite tape, which passes over a heated plate to partially melt the resin component of the composite and make it sticky so it binds onto the other layers. The first layer is applied onto a layer of conductive copper mesh that helps to protect against lightning strikes. Some human involvement is still needed. Inevitably, some tapes do not stick down properly, and a technician needs to ensure any loose pieces are pressed down by hand. But the machines reduce variability, work faster and complete more parts than the labour-intensive alternative. 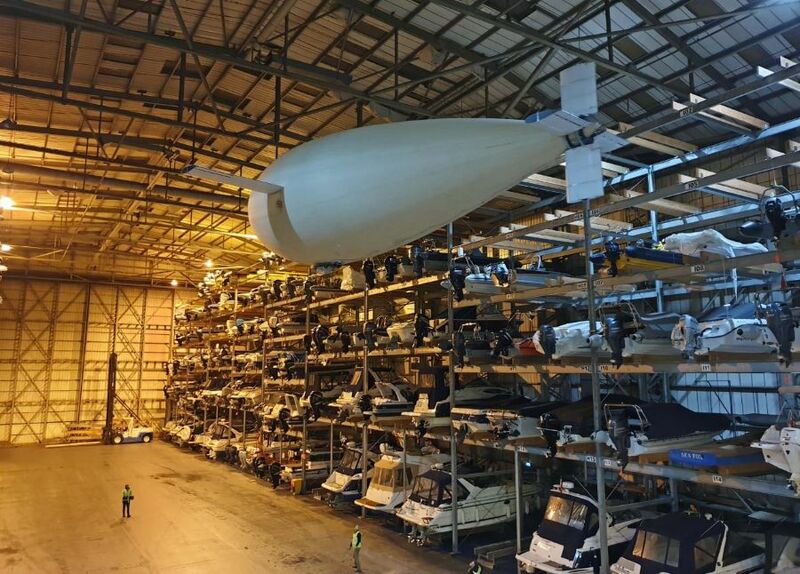 Completed wing covers are cured inside an enormous autoclave, which is capable of holding several wing covers at once on racks; Airbus is planning to add a second autoclave of the same size as part of its strategy to increase production rates. In the UK, a similar process is being undertaken at GKN, in Severnside near Bristol. Another section of the A350 wing, the rear spar, is also being made using automated fibre placement. The rear spar is a U-shaped component, running from root to tip of the wing, and forms part of the wing box and has the fixed trailing edge components bolted to it, including several moving components, such as the flaps that slide out on take-off and landing, and the main landing gear. GKN uses a slightly different process to make the rear spar, because of its complex geometry, explained GKN Aerospace in a statement. “Because the component has such exacting requirements, it has complex contours that allow it to carry heavy weights at specific points but remain lightweight and flexible,” the company said. Working with Airbus and Hexcel, the US company that supplies the composite tapes, GKN devised the manufacturing process in which the head of the fibre placement machine moves both along the length of the spar tool (similar to the way the wing cover machine moves) but also the tool rotates so that the fibres are placed around the U section spar. This ensures the fibre is placed in the correct location to the tool’s complex contours. Because the placement head has to be more mobile than that of the wing cover machine, the tape spool spindles are separate from the head rather than attached to it. Inspecting the composite rear spar: the component has a complex 3D shape. But composites are not the only focus of automated manufacture in aerospace. 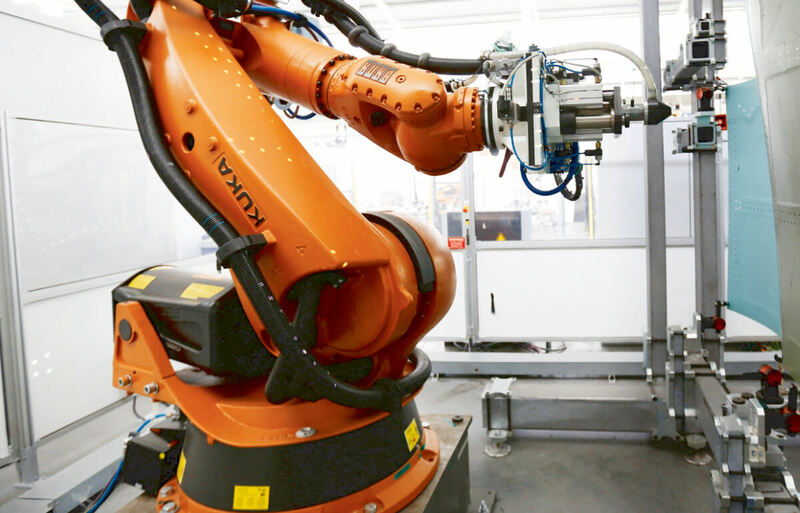 At the Advanced Manufacturing Research Centre (AMRC) at Sheffield University, automated manufacturing techniques are under development for a variety of sectors, including automotive and even housebuilding. However, with the centre’s focus on high-value industries, aerospace is a particular application area. 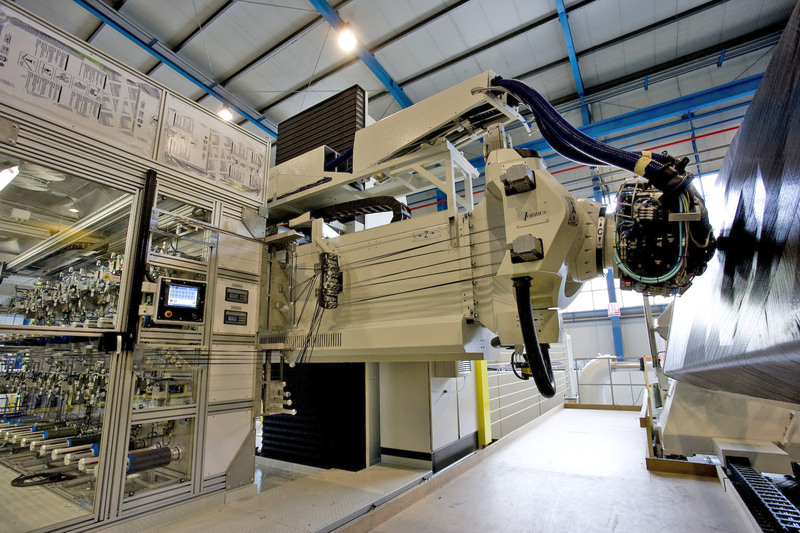 “We are working with a variety of aerospace manufacturers, including Airbus, Boeing and BAE Systems, as well as with the supply chain, and looking at both fully automated systems and assistive techniques, particularly for assembly tasks, that help engineers on the factory floor working on aircraft,” said Ben Morgan, head of the integrated manufacturing group (IMG) at the AMRC. One example of a process in aerospace manufacturing ripe for automation is hole drilling and fastening placement. Every aircraft needs many thousands of holes drilled in precise locations to hold panels and components in place, Morgan said, and this is a time-consuming and tedious task of the type that is generally seen to be more suited to robots than to people. Automated systems can achieve greater precision, and do not get bored or tired; drills capable of handling aerospace materials and layers of different materials are bulky, heavy and difficult even for skilled staff to use (Airbus mounts them on a sprung arm derived from the mount of a Steadicam mobile camera to assist operators). One process recently developed at AMRC and now in operation at BAE Systems’ Samlesbury plant on the production line for the F-35 strike fighter is an automated countersinking process, Morgan added. “Companies that invest in automation are not only seeing profits go up, they’re seeing employment go up”…Software is one of them, people are another. “….conductive copper mesh that helps to protect against lightning strikes.” Almost certainly sourced from a firm, located not a million miles from the East Devon/Dorset border, and for whom I have had the privilege of offering a series of ‘textile’ related lectures/tutorials! “…..Hexcel, the US company that supplies the composite tapes:” delighted to report that this firm and several of its associates was a client of MJB in the 80s! Known in the textile machinery field as a ‘stand-off’ creel! Nice to record that the majority of the structure and ‘skins’ of the very earliest aircraft were indeed fabric, shaped wood and wire! – All materials with ‘textile’ related properties. Perhaps we are simply returning to what we have always known well! I was interested in the picture showing various guides (they look like ceramic) for controlling/altering the direction of movement of the carbon filaments being handled. Based upon many years experience, and many experiences of issues with flat-band gatherings of filaments (with and without resins thereon) it is invariably the guides and their micro-surfaces which are the initiator(s) of problems. Call me if you agree, and seek help!